So, spring is in the air here in London and I've been reading plenty on what is good to eat right here, right now. Wild garlic leaves feature heavily in the food media, and this gets me excited- I imagine myself wandering English country lanes, wearing wellies and throwing a stick for my non-existent dog to fetch, while picking wild garlic to take home in a big basket for my dinner. It sounds wonderful. The truth is, the nearest I get to foraging in country lanes is me shuffling across the street to the corner shop for a beer and a pack of salt and vinegar crisps. I suppose I could go out and collect some of the nettles that grow along the footpath to the local train station, but I'm pretty sure that those plants are accustomed to being pissed on by local dogs and drunks, so I could be forgiven for not wanting to incorporate them into my meal. However, what I do have is Franklin's Farm Shop in East Dulwich, which is pretty much the city equivalent of the country lane scene I really have in mind. Instead of wellies I don skinny jeans and leopard-print flats, and instead of walking dogs people are wheeling their babies around in prams the size of small SUVs. 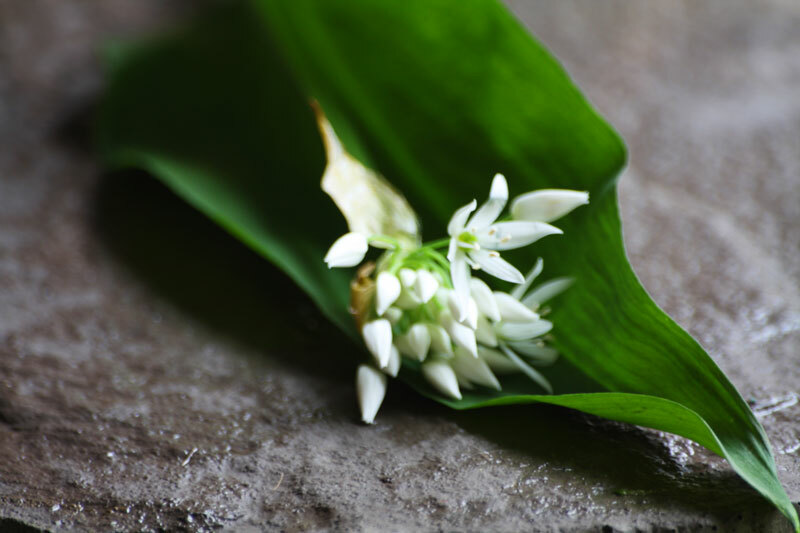 Oh, and the wild garlic isn't free. 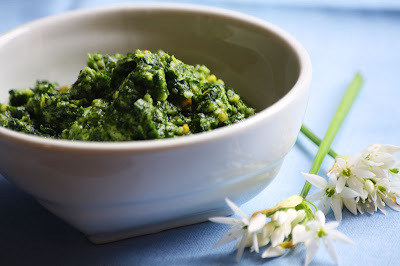 I take inspiration from Tom Norrington Davies' article in the Guardian, and decide to whiz my garlic leaves into a fragrant pesto. I use a food processor because I'm lazy, but you could use a mortar and pestle too. Whiz up the nuts first until they are finely chopped, then add your leaves. Pulse them a few times until they are roughly chopped and then add your cheese, salt and pepper to taste, and about 2 tablespoons of olive oil. Then let the machine run for 30 seconds or so, drizzling more oil into the mix until you have a loose paste. Add a queeze of lemon julice for a little brightness, and you're done. Hi Stephanie: Thanks for visiting our blog, as soon as I saw your comment I was excited to visit yours and find a like minded heirloom vegetable enthusiast. I look forward to seeing what you do with your jersey royals. Hi, thanks so much for looking at my site- you're officially my first commenter! Woo hoo! I'm only 2 weeks in to this blog business, but enjoying the extra motivation it adds to thinking about great ingredients and what to do with them. Would love to submit to your spring garlic roundup, thanks for the invite. That's great, I hope you enjoy it! Then you can keep the weeds under control and get a free lunch- so efficient! Hey Stephanie: just saw your note that I was your first commenter: so cool! Well, I would never have guessed your blog was so new, it looks so seasoned and professional. Looking forward to reading more!